BBX Thailand has had real problems since its inception. Going through multiple owners under founder Michael Touma’s direct care, it eventually ended up with Cameron McKean who resigned after the founder’s death and a string of unresolved issues that destroyed his confidence with the founder’s daughter who was running the show. His resignation letter was basically the start of The BBX Investigation. Let’s dive into Asia and come up with all the bits that make sense . . .
Like all other BBX franchises the BBX Thailand operations has huge currency debasement. Membership numbers show a moderately successful exchange with 1599 accounts on the books of which 506 have traded in the last 12 months. This makes it a relatively active exchange, indicative of something actually being done over there, unlike NZ, India, Costa Rica, and so on who are all pretty much dead! The major points from the data is I see it is a closely balanced set of books. There should actually be no missing transactions in a Mutual Currency system, period. That there can be missing transactions is a cause for serious concern. This indicates that fraud is likely but when and how this occurred is anybody’s guess working from the figures alone. The missing transactions in Thailand total only $406,102.15 (I have converted all BBX Thailand’s THB to USD for easy Western viewing) which represents % of Members in credit. Compare that with Australia (%), UK (%) and NZ (%) and there is a good chance that the current BBX accounts have either been tidied up or that they have been cleaned in some way. More from Cameron on this later in this post. The next thing to note is the ultra-high ratio of bad debts. This is all due to BBX spending over the years. I do not think that there are major bad debts from members in the BBX Thailand system for two reasons, first, I know the history of the exchange and secondly I understand that the Thai culture can be quite brutal at times when things go wrong. It appears to me that the latest franchise holder has made attempts to clean the database and membership up. The result is that the figures probably reflect reality quite accurately. The first thing that anyone would do when inheriting a messy system is to go after all bad debts. If a debt is uncollectable, the correct thing is to move the account into the bad debts. Keeping them in the system (as UC did for years) is a deception, designed to present the books as balanced. When the Founder operated BBX for himself and his family, this didn’t matter. When others come into the system however it does. Obviously with the whistleblower pulling out of the BBX brand and business there had to be something more. The word from BBX management was that Cameron had got the flick as a result of being caught out setting his own exchange up. I have previously explained that this is factually incorrect. I determined very on in the BBX Investigation that he had a long-term list of grievances right back to when Michael Touma “sold” it to him and then ongoing conflict with the management team in the time that the Founder was incapacitated and passed away. While I haven’t done auditing of the figures what I present here does have significant circumstantial evidence in support. Some of this may be perfectly valid expenditure for the operation of the exchange however viewing the huge impact upon a smaller to mid-sized exchange, and knowing that the members will never see any of this back into the system, it is entirely bad debt. How this situation came about where the debtors to the system are not collectible is a story in itself but the fact that the buyer was told something that didn’t occur is typical of the over-promise and under-delivery around the founder’s deals. In a Mutual Credit System the debts cannot just be deleted. For the seller of the exchange to say that the new owner was not liable shows that deception occurred at the point of sale. Buying a clean system must mean that debits equals credits. Cameron seems to have walked into an exchange with BIG problems, huge debt and all his members wanting to spend with nothing available! 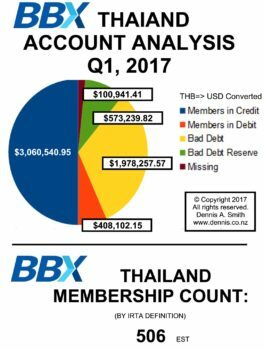 If we look at the realistic probability that all debtors in Thailand prior to the last franchisee taking over are not collectible; that bad debts are huge and are BBX accounts; that the debt reserve fund is negative by a lot, then the barrel is well and truly empty! The backing of the BBX Trade Dollar (THB equivalent) is NIL. Unlike BBX Australia and BBX UK who have ceased communications with me, and BBX New Zealand who has basically gone AWOL, I was able to get comment from Cameron McKean, the BBX Thailand Franchisee who told me [over several calls] the following. I had known Micheal Touma for a long time and when he offered me the BBX Thailand master agency I refused him, twice. He flew up to Thailand and eventually managed to get me to take it. I didn’t buy it because no money was to change hands, and that was in the contract. He gave it to me, and really wanted me to take it. I never signed the contract because it wasn’t exactly what Michael and I agreed. Basically, Dennis, yes, to answer your question, yes I was conned. The exchange was a mess and nothing like what I was told. I did the best that I could, put a lot of time and money into it and when I found out that I (and others) had been lied to about Michael Touma in his days of incapacitation, I resigned. I can’t and won’t share at this stage the checkered history of the BBX Thailand exchange because I have yet to verify the stories from all parties fully but it does seem that there has been a long history of trouble up there, and going back years. Since Cameron’s resignation there appears to be no love lost between the parties involved. I am aware that Magali Russo has flown to Thailand to relaunch BBX with ex-staff of BBX Thailand and I have seen the BBX staff establish a new barter exchange (Club Barter). As there were some twelve people in the room at the relaunch of BBX including staff and associates of the new BBX business, and this from a membership of 1599, and active members of around 500, I suspect that the barter wars in Thailand have already been won and that BBX Thailand is a spent force. There is still a further twist in the BBX Thailand story, BBX UK was the first BBX country franchise to join IRTA. John Attridge did that at the outset of his exchange. Micheal Touma however ‘hated’ IRTA, and with a passion, but BBX International under the founder’s second daughter’s leadership joined BBX pretty much as soon as she could. BBX Thailand did not and would not ever join IRTA, certainly under Cameron McKean’s leadership. With BBX in array and fast slipping into oblivion, the issue of IRTA’s involvement in supporting one of their members under attack, and the messy matter of BBX’s off/on and partial membership is now rapidly becoming moot. There’s more to come . . . standby! I’ve always found the truth to be in inverse proportion to the amount of ‘noise’ surrounding the story – always.